There comes a point when your baby becomes more interested in trying on your shoes, rather than mouthing them. Today is that day. It’s a small victory. This morning I took 80 on a bike ride. We got home, and she refused to get out of the bike seat. She held the crossbar down and shook her head vehemently (well, it looked vehement with her bike helmet on). So I went out for another ride. 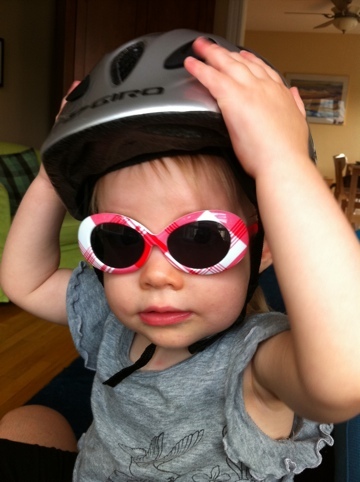 While biking, I tried to tell her if we were going to hit a bump, so she wouldn’t be startled. She started signing [more] after a bump, and I started looking for rough patches in the road. We went down a hill, fast enough to pick up some breeze. 80 lifted her hands from the bike seat crossbar and put them above her head in the typical “rollercoaster” fashion. It was spontaneous on her part, so I wonder if it’s innate (also, why). It made me giddy to see her do it, knowing she was experiencing a flying feeling, and probably some baby euphoria. That long set of rides readjusted my view on our lives. We went out and did something we were both happy to do. If we can have more experiences like this, I can continue to handle this stay-at-home thing.